Street Fighter IV was released in 2010. This year, in 2011, Super Street Fighter IV Arcade Edition was released. What about next year? 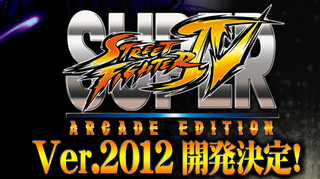 2012 is getting Super Street Fighter IV. At the EVO fighting game championship, Capcom revealed that it was working on Super Street Fighter IV Arcade Edition Ver. 2012. Details about this updated version are forthcoming. Though, last December, Capcom's Seth Killian said that Arcade Edition will be the last version of Street Fighter IV. Guess it will get a 2012 version.